Cord & Thread There are 7 products. 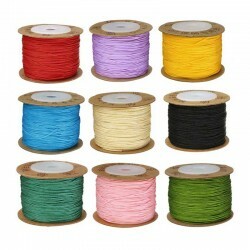 Wax Cord 0.8mm Waxed Thread DIY Bracelet Jewelry making. Suitable for beads with hole diameter 1mm and more. 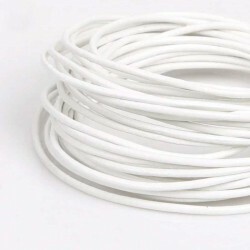 You will get 1m of this quality waxed cord. 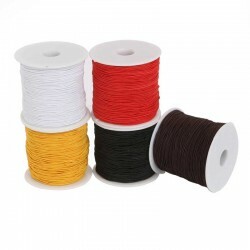 Style: Waxed Nylon Cord Thickness: 0.8mm Length: 1m Available in many popular colors - please choose your favorite color Note: When ordering more than 1m, will be send in 1 whole piece. 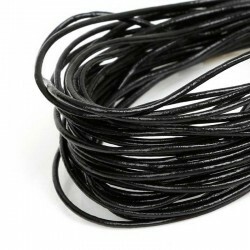 Wax Cord 2mm Black Waxed Thread DIY a Necklace or Bracelet Jewelry making. You will get 1m of this quality waxed cord. Style: Waxed Cotton Cord Color: Black Thickness: 2mm Length: 1m Note: When ordering more than 1m, will be send in 1 whole piece. Wax Cord 2mm Red Waxed Thread DIY a Necklace or Bracelet Jewelry making. You will get 1m of this quality waxed cord.Style: Waxed Cotton Cord Color: Red Thickness: 2mm Length: 1m Note: When ordering more than 1m, will be send in 1 whole piece.